MerryLegs watched Earl Grey load onto the back of the flat-bed hydraulic lift thingy from about 20 feet away in her pen with interest and not a hint of fear. 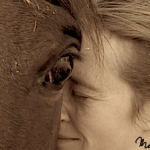 LOVE that horse. I was promised bad things happen in threes. I was sorta hoping that my sister dying 4 months ago counted towards (1) MerryLegs internal pigeon fever fiasco, (2) Matt getting in an accident and wrecking one of the trucks….but NO. Apparently getting married breaks the cycle of bad things and the count starts over. Thus leaving me one tragic event short. Victim of a Fate that can actually count to three. Apparently the combination of new tires, an oil change, and passing smog this week went to his head. And he decided it would be a good idea to arm the “theft-deterrent” device randomly while parked at the stable. The theft-deterrent alarm and its associated ignition cut-off has been the bane of my existence. When the battery went dead 2 years ago (like not just in the not-charged sort of way but in the you-desperetely-need-a-new-battery sort of way) and the tow truck driver and I were trying to jump the car, it was a nightmare because the battery would charge enough that it reset the alarm, which activated the ignition cut off, which we then had to wait ’til it ran its course which used up battery…and then hope there was enough residual battery and it decided to cooperate with my key and then start it. Fun. During that process we gently removed ripped random wires out and managed to at least silence the horn that went off when the alarm went off and thus preserve most of our sanity when working with it. My battery was fine, and I haven’t used the keyless entry fob for YEARS, which is how I used to accidentally set the system. And yet somehow the alarm system was set, and somehow when my husband opened the door of the car it went off. And completely ignored all begging, pleas, orders, shouts, properly-executed-per-owners-manual maneuvers to stop the alarm and release the ignition. That went to THIS car. And the key was in my hand and NOT locked inside the car (I know, a minor miracle) and yet…..this did not mean I could start the car and drive the seven miles home from the stable. MerryLegs, 20 feet away, was amused. Farley, within sight and hearing distance, was amused. Matt and I were not amused. We waited 30 min for a tow truck. After shedding a tear since this is the FIRST TIME this car has ever truly failed me, and then trying out the ostrich theory (Mel: Can we just walk home and leave the car here and worry about it later? Her better half: NO! 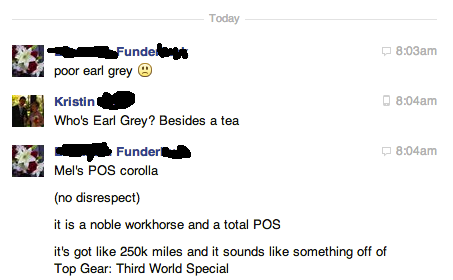 ), I *finally* saw the humor and acknowledged that yes, Earl Grey is a POS and perhaps my next car will be both a definable color *and* not have so much personality they demand a name. ….But probably not, because I’m cheap and prefer to have too many horses, eat excellent food, a reliable truck, and money to pay entry fees for torture endurance events. I can count to three as well as anyone and I am at THREE. A vehicle, a horse, and a person. That’s called “broad coverage” and should be sufficient to satisfy. Project of the day is to find weird battery that gives life back to the key fob which I stopped using because I kept accidentally setting off the alarm, but that also DEactivates the alarm if one deciphers the buttoms correctly. If that works then I’ll keep the fob in a safe place (ie glovebox) and we continue our march towards June, graduation, and possibly a new car. Problem? I have this really cool idea to teach MerryLegs the concept of tying and my squirrel brain truly can’t decide which is the bigger priority…..
Nooooo! I’m so sorry, that’s maddening. May you be finished with your triumvirate and the rest of your time off be uneventful. I felt the same way about my old junker, which hit 237k and only truly failed me once, last winter. I have a nice, reliable, clean Honda CR-V now, and it’s not quite the same yet. No personality at only 40k miles. PS – I’d go with the tying thing. Horse fun > real life errands. Please forgive me for saying that I loved this post. All the bad things I do not love, but your humor and writing, I do. Update. Key fob hack did not work. And, in better news. While trying out different hacks he found on the Internet to fix the alarm thing, my car was further….ummmmm…..broken. It goes to the shop tomorrow. Went out to clean it out in prep for putting it in the shop and now it works TOTALLY ONE HUNDRED PERCENT FINE. We don’t know what the hell happened. Best guess is with the hundred or so hacks we tried, we fried it’s brain for a while and then it somehow reset itself, but the alarm is still shorted out? No clue. I’m scared to drive it. Matt is in shock that it started and I’m not sure I totally believe in it either……how can it go from completely dead and “more broken” to completely fine three hours later? Matt wants to go out and try to break it again and see if he can “fix it”. I’m not at all sure this is a good idea and think I’ll take the truck out to the stable and ride…. Went back out after writing this and it didnt work…and then it did…and then it didnt…..AND THEN WE FIGURED OUT A KEY FOB HACK. and now im good. I think. I always find those bad things happen to me in fives – that’s just how it works for me. Whoever came up with the idea of threes is one lucky SOB. I have to agree with Redheaded endurance, this was a funny post.. atleast you don’t panic.. and neither do the horses as the alarm is screaming at you. can’t wait to hear how the tying thing works out for you. We will have to continue to trade notes..
BTW- discovered Otto DOES NOT LIKE hind let straps on the blanket today.. sigh. more work to do with that. He was pretty sure an alligator was trying to eat both of his legs off. ! I’m sorry to laugh at your misfortune. Snicker. Snort. Chuckle. Giggle. Gack. But if this is #3, the universe is just yanking your chain. Because having a possessed car is more than slightly awesome, once it’s sold and the title is safely transferred to some unsuspecting stranger. Might help to sage it out before trying to foist, er, rehome it. Just a suggestion…. So, it started and Matt and looked at each other and screamed SELL IT. LOL. If it gets me to graduation, then I’ll see where I stand. It’s probably worth $1200-1500 right now and the alarm thing is totally workable (ie, the unsuspecting person would never even know….) as long as you have the magic key fob. I’m having sweats thinking about losing said Keyless entry fob…. I wouldn’t be that mean. I would show the person how to deactivate the alarm and just not go into the details of “if you don’t have the magic key fob….). It’s a $1000 car. What did you expect? I do indeed hope that you are covered far and wide for a long time to come after all of this nonsense! Eegads.